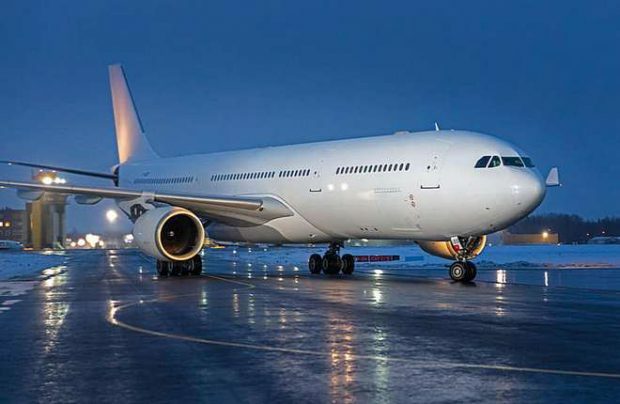 Lithuanian charter airline and ACMI (aircraft, crew, maintenance and insurance) provider GetJet Airlines has taken delivery of an Airbus A330-300, thereby adding a wide-body aircraft to its fleet for the first time, and allowing for expansion into new markets. It is also the first A330-300 to be operated in the Baltic States. The 300-seater aircraft, which has a designated business class capable of accommodating 30 passengers, has a market value of US$70 million, the airline says. With this long-range capability in the GetJet Airlines fleet, the Airbus A330 will enable it to operate transatlantic flights. Delivery of the Airbus to the Vilnius-based carrier, which was founded as recently as 2016, allows it to expand its operations to new markets, as the aircraft can cover much longer distances than the company’s current fleet of Boeing 737-300s and -400s and Airbus A320s. “We have demonstrated strong and sustainable growth over the past three years. Our growth rate quite literally doubled every year,” enthuses Darius Viltrakis, chief executive of GetJet Airlines. “Therefore, over the next couple of years, our goal is to stabilise and shift our focus from growth to optimisation and [improved] efficiency,” he adds. “A fleet of 15-20 aircraft is optimal in our business, but adding the A330 will allow us to try out new business paths. We are already talking with several potential clients and should this project be deemed successful, we might consider adding several long-haul aircraft to our fleet in the future. “This feels like a natural step for our ambitious company and it will certainly [also] strengthen our position in the ACMI market,” says Viltrakis. For the summer season of 2019, GetJet is to replace Small Planet Airlines, another Lithuanian ACMI provider that declared bankruptcy last year, in the operation of charter flights from Vilnius airport on behalf of Novatours and Tez Tours. Getjet Airlines plans to have 15 aircraft by the end of 2019.